...and now for something completely different. No history, no war[a], no genocide[b]. Just a little Snail's Heart beating with love. 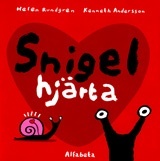 Snigelhjärta ("Snail's Heart"), is a lovely little book that I picked up by chance. The basic theme of the book is a thought-experiment about what would happen if love were in the heart. In that case, the snail hides its love far up in its shell, so nobody can see it. The shark has strong feelings, and so on. The author, a non-graduated zoologist, end up closing the book disagreeing with the premise; if one is allowed to use such clinical words to describe the lovely ending. It is one of those times when the total is more than the sum of its parts. The illustrations complement the text beautifully. With their their simplicity and focus they are trimmed to the point of perfection - nothing more can be taken away. The text itself works a lot better than it has any right to if one just considered the premise. In the end, the result is just heart-warming in a way that is difficult to describe, but far in excess of what I thought was possible. Personally, I disagree that there is a sharp division between the two. First, small kids tend to have fun easily. Just give them a rock to play with and they'll have the time of their lives. Second, a lot of the "kids stuff" has always had a adult subtext. Fairly tales such as Little Red Riding Hood and The Boy Who Cried Wolf have had multiple layers where only the uppermost have been for kids, while still communicating adult themes. It should also be noted that children spend a lot of their time growing up. By that I mean not just getting physically bigger, but also understanding more and more of the world they are in. Such understanding is impossible unless the child is somehow exposed to material that is above its current level. Therefore I would say that a book that is purely for children would be a very bland book - much like a book for adults that had extirpated anything that could be perceived as "not adult" would be one dreary, humorless read indeed. Fortunately Snigelhjärta is neither. It is a little book with a tome of love.